A bizarre range of clothing and other items have been recovered from the nests of rare birds of prey reintroduced to the North East. 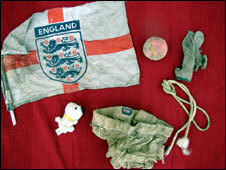 A pair of underpants, an England football flag, two white socks and a soft toy were among objects recovered from the nests of red kites. The birds are known for stealing items from washing lines to make nests. Bizarre, but wonderful to know that these beautiful birds are starting to make a comeback in the north of England, following their reintroduction after becoming extinct in the region in the early 1800s. I’m now wondering if my phantom odd sock pilferer is one of the avian residents of the garden!